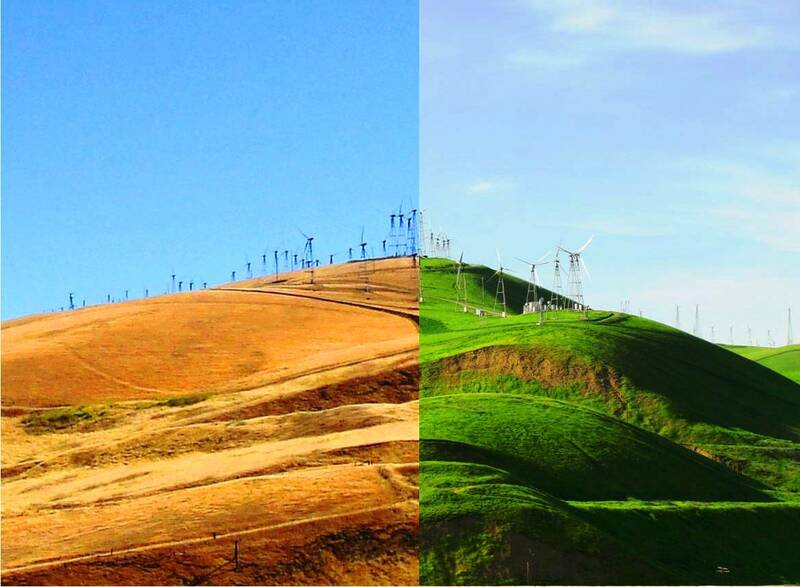 This is the time of year when the hills that line the Central Valley undergo a major change. During the winter the hills green up if we have a lot of rain like we did this season. The hills look really different when they are green. In this picture you can see that the trees that are leafless in winter are silhouetted against the green hills of the Central Valley. I took this picture yesterday and you can see that the hills are already starting to turn brown as summer approaches. Here is a picture from late last spring. You can see that the hills are almost entirely brown. Soon they will look like this again, and with the right light they will appear golden brown. Every week day my commute takes me up and over the Altamont and the color is rapidly changing. Just a week ago the hills were a beautiful green like on the right in the picture above. Each day the hills have been loosing their color and soon they will look like the left side of the picture again. The cycle of seasons continue and the only question is usually how green the hills will get in the winter. This year they were very green as we had a lot of rain. Now, how long will it be until they are golden again? 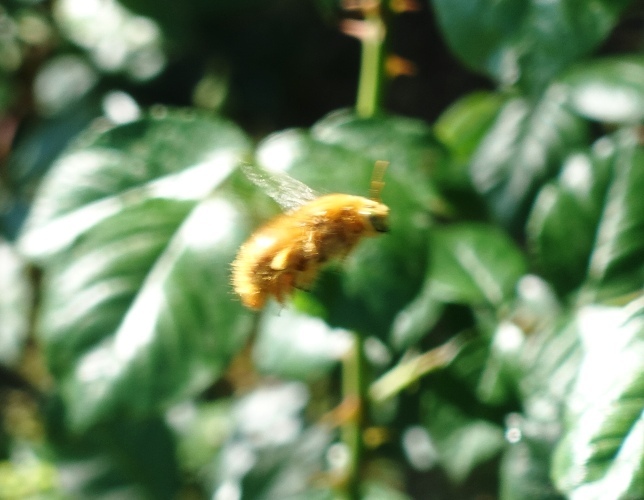 This afternoon I tried to capture a few good pictures of a carpenter bee that was pollinating my rose bushes. 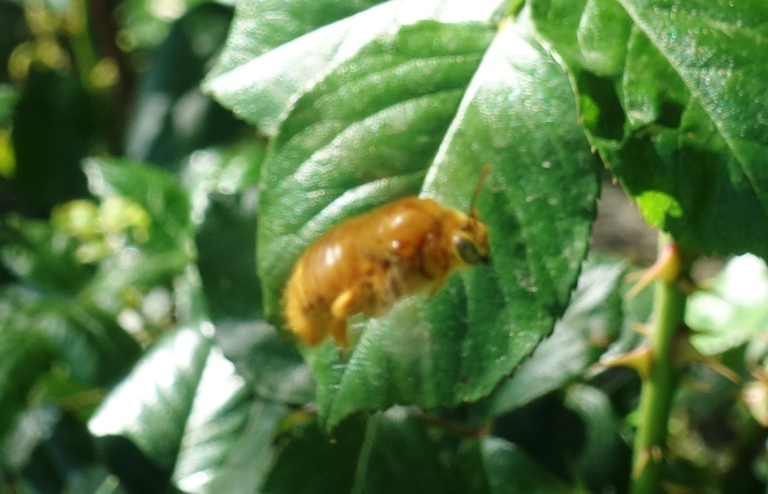 This is a valley carpenter bee (Xylocopa varipuncta). The male of this species is gold and the female is a metallic black. When writing a post two years ago about A Bee in my Rose Garden I found out that the male does not have a stinger. I decided to not worry too much about him stinging me and tried to get close and get some pictures. The valley carpenter bee is the largest bee in California and can be as large as an inch in length. Even so, it was really hard to get a good picture as he is a fast little guy and rarely stays in one position for any length of time. 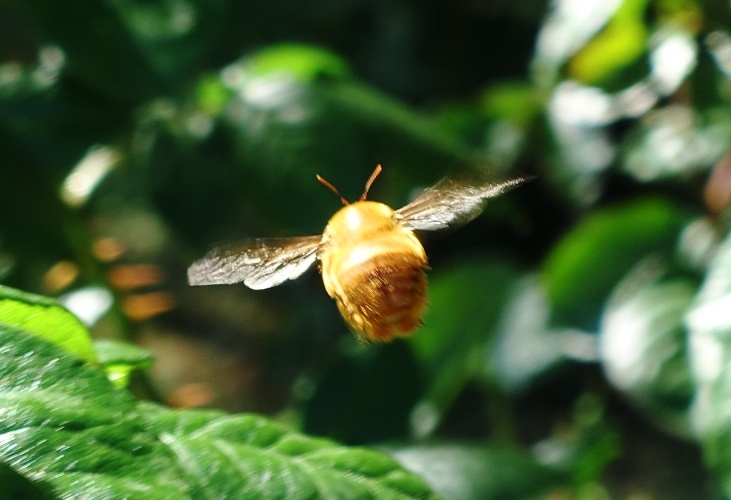 The wings on the carpenter bee move so fast and make a very distinct droning sound. You definitely know when one is around. I always hear them before I see them. 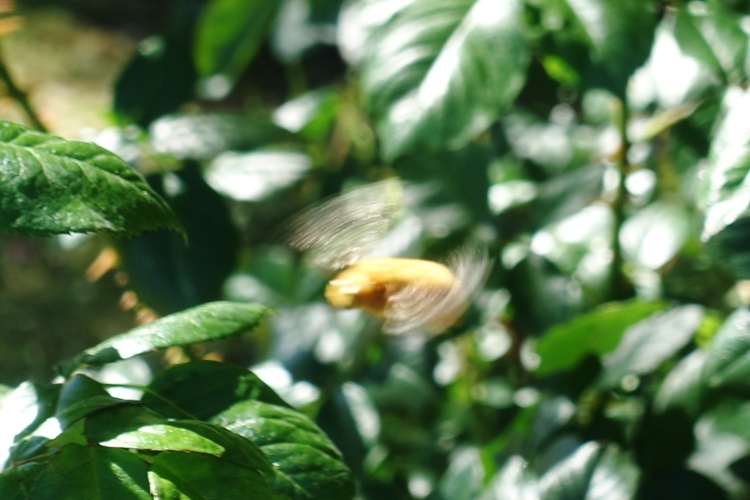 Even though the picture above is really out of focus, it catches the fast moving wings and gives you a bit of an idea of how fast he is moving. I still didn’t get this one quite focused, but you can see a bit of detail. He is an interesting looking little bee. I saved the best focused picture for the last. It really is an amazing looking little bee. It is a marvel as to how this fat little bee stays aloft. My nickname for this little bee is the Golden Snitch. 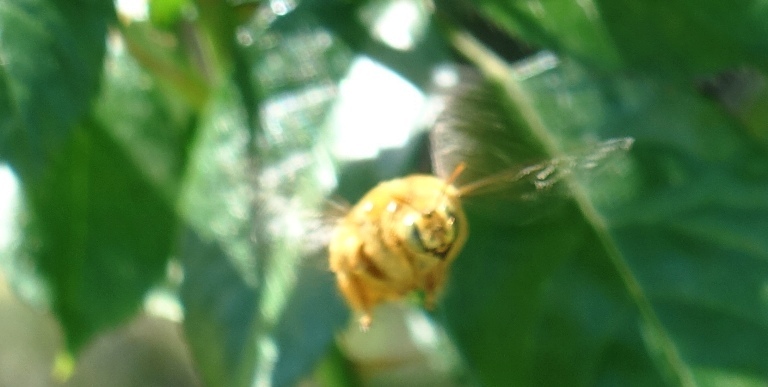 I am still trying to get a good picture of a female valley carpenter bee. I have seen a few of them, but mainly among the blossoms of the trees in the yard and a bit out of reach. I hope you enjoyed these pictures even though they are a bit blurry.